Norfolk, Neb. ? Three holdup men shot five people to death in a bank robbery Thursday before fleeing into the Nebraska countryside in a stolen car. A manhunt ended a few hours later with three suspects in custody and charged with murder. It was the nation’s deadliest bank robbery in more than a decade and it spread fear across northeastern Nebraska. The men allegedly stole two cars in their bid to escape, taking one at gunpoint in this small farming town. Four employees and a customer were killed at the U.S. Bank branch, a one-story stucco building with twin glass doors in the middle of a strip mall parking lot. Another customer was wounded in the shoulder by gunfire. Authorities would not say whether the gunmen got away with any money. The suspects were stopped in a stolen pickup in O’Neill, a ranch town 75 miles west of Norfolk. They were identified by police as Jose Sandoval, Jorge Galindo and Erick Fernando Vela. No hometowns or ages were immediately available. All are charged with five counts of first-degree murder, which carries a potential death sentence in Nebraska. Police Chief Bruce Mizner had tears in his eyes as he read the victims’ names at a news conference. The employees Lola Elwood, 43, Jo Mausbach, 42, Lisa Bryant, 29, and Samuel Sun, 50 and customer Evone Tuttle, 37, were found dead at the scene. 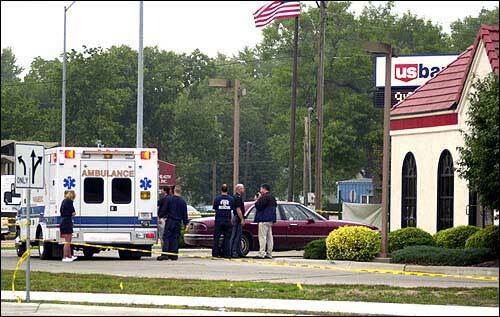 Rescue and law enforcement officers stand outside a U.S. Bank branch after an armed robbery in which five people were killed in Norfolk, Neb. Rain was hampering the search Thursday for three men who fled on foot and were seen driving away in a white Subaru taken from a nearby home, Police Chief Bill Mizner said. The suspects were apprehended. Mizner said it was unclear what went on inside in the bank, though the wounded customer and two unharmed employees may be able to help. Investigators did not immediately have the special equipment needed to view the bank’s security tapes. After leaving the bank through a shot-out glass door, the gunmen broke into a nearby house where they confronted the home’s residents and stole their car, Mizner said. No one in the home was injured. The suspects drove about 10 miles, ditched the car and stole a pickup truck, Mizner said. Authorities tracked down the first car, a Subaru Outback, by using its satellite navigation system. As news of the crime spread, Gov. Mike Johanns declared a state of emergency and authorized the use of a Black Hawk military helicopter for the manhunt. Roadblocks were set up throughout the area. Schools in Norfolk were locked down and students were forbidden to leave without an adult. Many banks in the area either closed or allowed only drive-through window transactions with customers. Dale Tomka, a florist, said he saw the gunmen shortly before the shootings and that they were wearing stocking caps, possibly ski masks, and one of them had black stripes painted on his cheeks. The gunmen were also described as wearing dark, baggy clothes. “I thought they were weird and looked out of place,” Tomka said. The suspects were stopped at a gas station in O’Neill after an unidentified “lookout” just outside town called police after spotting the pickup. Mizner said authorities had not determined why the bank door was shot out, but it may have simply been shattered by the gunfire inside. A stray bullet shattered a drive-through window at a Burger King next door to the bank. No one inside was hurt. The killings stunned this community of 25,000 people about 90 miles northwest of Omaha. Norfolk is best known as the hometown of comedian Johnny Carson, but it is also the economic hub of rural, northeast Nebraska. “People are scared to death,” said Mike Renken, president of the Bank of Norfolk, which closed its drive-through branches in the city. Rain prevented the State Patrol from immediately using its helicopter and three planes in the search. The patrol, which has a troop headquarters in Norfolk, pulled in officers from other areas to help. The governor and executives with the bank’s parent company, U.S. Bancorp of Minneapolis, flew to the community upon word of the shootings. “Obviously this is a tragic situation and we’re trying to cooperate with police and do all we can to help in the investigation,” said Steve Dale, a U.S. Bancorp spokesman.